Harada Seicho was born on August 26, 1940 in Nara, Japan, to a temple priest and his wife. He was their third child and second son; three younger children, all girls, completed their warm and loving family. He had a normal childhood, playing with his younger sisters and leading them into the usual mischief children get into, including devising creative ways to get unto the theaters for free to view his passion – adventure films. The temple was poor and times were hard; there was no extra money for such things. It was early, so the buses were very crowded. I had to push through his packed crowd of people to board the bus. Then move all the way to the back. As I did so, all of a sudden I came up someone who struck me as most unusual. He had a mysterious presence - there was something luminous about him. There he was, an old priest in robes, wearing glasses and reading a book, yet he glowed with a type of light. In comparison, the people around him seemed so weighed down by their thoughts and cares. I stood in the aisle, a youth who didn´t like Buddhism and lived in a temple only because of the circumstances of his birth, and yet I was deeply moved by this intelligent- looking man who seemed so deep and so still and who radiated such brightness of spirit. Why did he seem so different from everyone else on the bus? I had never met a person like this before, and I couldn´t figure out what was so inspiring about him. There I was, having been brought up in a way I didn´t want to continue, thinking that temples and priests were really not appealing, when all of a sudden this mysterious person appears with all his great depth, who was obviously a priest. Why would he choose this way of expressing himself? I was so intrigued by this man and the question he was presenting to me by his whole presence, that when the priest got off I followed him. It turned out that this person, Yamada Mumon, was on his way to Reiun-in, a small Buddhist temple in Myoshinji. I followed him right to the gate and saw him go in. He trained hard at Shofukuji, doing many intensive week-long retreats (sesshins). However, after one particular sesshin he felt completely dissatisfied with his mind state; though he had been trying very hard, he still hadn´t realized kensho. After two further years of intense training and still no kensho, he sought out Mumon Roshi to ask his permission to leave the monastery. He wanted to go into the mountains to practice alone until he attained awakening, he said. 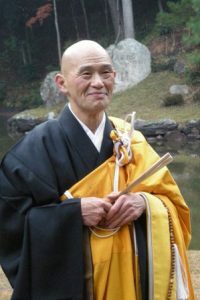 Mumon Roshi said nothing but looked at him for a few moments, then asked, “What will happen if you don´t realize kensho?” “I won´t come back until I do!” was the determined reply. He was given permission to go. Shodo Harada (Roshi), „ How to do Zazen”.Translated (From Japanese and biography) by Priscilla Storandt and Thomas Yuho Kirchner, The Institute for Zen Studies, Kyoto, Japan 2010.